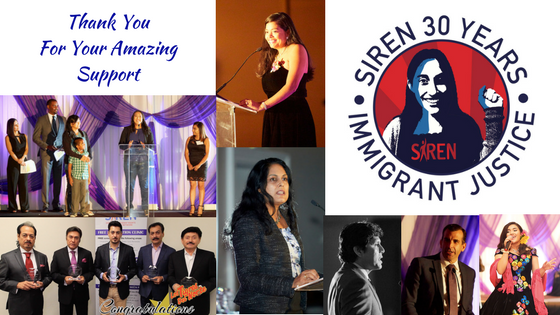 Words are not enough to express our gratitude for your support of SIREN’s 30 years of service to our community! Thank you for joining us at our special celebration on October 27, 2017. We extend our heartfelt thanks to every single one of our generous sponsors and attendees. We could not have done this without you. Please join us also in thanking our Keynote Speaker Kevin de León, Mayor Sam Liccardo, as well as our phenomenal MC's - Lorena Domínguez of Telemundo 48 and Marcus Washington of NBC Bay Area. We would like to also invite you to our online gallery of images by the very talented Erich Valo. Once again, thank you all for your kind support! Here's to 30 more!